Toy train will chug out of Siliguri Junction station to Darjeeling on Christmas, after a gap of four years. Toy train services between Siliguri and Kurseong got disrupted in June 2010 following a landslide on NH55 at Paglajhora, between Gayabari and Kurseong. The landslide had swept away around 500m of the road and the toy train tracks running parallel to it. Although trains used to run from Siliguri till Gayabari - around 34km from here - another landslide on the highway at Tindharia, between Chunabhatti and Paglajhora, on September 2011 cut short the train service till Chunabhatti - around 27km from here. Senior officials of Northeast Frontier Railway (NFR), who were in New Jalpaiguri today to attend a government event, said the toy train services between Siliguri Junction and Darjeeling would resume on December 25. "It gives us pleasure to announce that finally, the toy train will resume its journey from Siliguri Junction station and move uphill till Darjeeling (the terminal station) from December 25. Restoration work on all the damaged stretches has finished. We also ran the toy train on trial basis after completion of the work and have found things to be satisfactory," said A.K. Sharma, the divisional railway manager of Katihar division of NFR. "We hope a considerable number of passengers and enthusiasts who are keen on enjoying this journey will take rides in their favourite toy train," the DRM added. The service between the Kurseong and Darjeeling stretch is smooth without any disruptions. In another development, three new offices were opened on the NJP station premises today to provide better services to passengers and tourists. The state tourism department has funded a police assistance booth which would be manned by Siliguri metropolitan police personnel, a prepaid taxi booth and a tourist assistance booth. 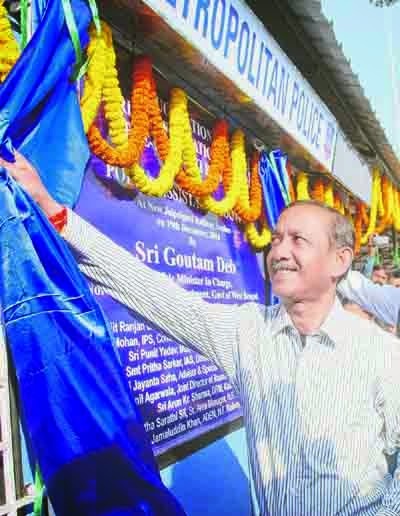 North Bengal development minister Gautam Deb was present at the inaugural programme and launched the facilities. "A sum of Rs 19 lakh has been spent for building these booths. The state is putting impetus on tourism and we hope these offices would help tourists and passengers," said A.R. Bardhan, the principal secretary of state tourism department. Darjeeling Toy Train service to resume from Siliguri Junction station to Darjeeling on Christmas after a gap of four years.